Ram chief Reid Bigland speaks at Ram 3500 HD unveiling. “Simply stated, the Ram heavy duty will out-power, out-tow and out-haul every other heavy-duty pickup truck on the market,” Reid Bigland says. DETROIT – The battle intensifies between Detroit’s fullsize truck makers as FCA US’ Ram brand launches a fully re-engineered generation of 2500 and 3500 heavy-duty pickups here at the North American International Auto Show and arriving in showrooms in the second quarter. With the characteristic chest-pounding often associated with unveiling new pickups, Reid Bigland, head of Ram, talks up the brand as the No.2 HD pickup producer in the U.S. (behind Ford). “Ram is recognized as building the longest-lasting heavy duties,” Bigland says at a press conference on the show floor at Cobo Center. But Bigland is particularly proud of the Cummins 6.7L inline 6-cyl. High Output Turbodiesel, enabling staggering peak torque in the Ram 3500 of 1,000 lb.-ft. (1,355 Nm), as well as a 35,100-lb. (15,921-kg) tow rating and 7,680-lb. (3,484-kg) limit for payload. Other upgrades to the Cummins I-6 include a new compacted graphite iron block, cast-iron head, exhaust manifold and exhaust valves, springs and rocker arms. Lighter and strong pistons include new low-friction rings and connect to the crankshaft via new forged connecting rods and bearings, Ram says. The 400-hp Cummins diesel is 60 lbs. (27 kg) lighter than the previous-generation engine. The variable-geometry turbocharger with laminated heat shields mounts directly to the exhaust manifold, delivering boost pressure of up to 33 psi (2.3 bar). With 90% of HD truck owners using their vehicles to tow large loads, Bigland says the High Output Cummins engine will be attractive to many customers. “Simply stated, the Ram heavy duty will out-power, out-tow and out-haul every other heavy-duty pickup truck on the market,” Bigland says. A variant of the Cummins diesel is rated at 370 hp and 850 lb.-ft. (1,084 Nm) of torque. For those preferring gasoline, the Ram 2500 and 3500 trucks will come available with the 410-hp 6.4L Hemi V-8, rated at 429 lb.-ft. (582 Nm) of torque, able to run on regular unleaded. The Hemi V-8 will be mated to an 8-speed automatic transmission for the first time in the segment, Bigland says. Six-speed automatics are standard with the diesels. Ram says active noise cancellation, anti-vibration devices and acoustic glass contribute to its quietest HD cabin yet, while ride quality improves with new suspension tuning that includes Frequency Response Damping shocks, progressive springs and re-engineered bushings. Ram says its class-exclusive rear air suspension now features driver-activated Bed Lowering Mode, Normal/Payload Mode and Trailer-Tow Mode. With the additional torque comes improved brakes, including upgraded calipers, booster and master cylinder to help shorten stopping distances and improve brake feel. Likewise, the Ram 3500 is offered with an all-new, larger 12-in. (30-cm) rear axle (sourced from American Axle) to pair with the new engine. The steel frame underbody, consisting of 98.5% high-strength steel, is lighter and more rigid than the one it replaces. An aluminum hood contributes to overall weight reduction of 143 lbs. (65 kg). A new 360-degree surround-view camera with trailer reverse guidance view provides a single display of both sides of a trailer to assist drivers in maneuvering. Active-safety features include Adaptive Cruise Control, Forward Collision Warning and Automatic Emergency Braking with trailer brakes. The interior is completely new, carrying over the design language seen in the light-duty Ram 1500, a 2018 Wards 10 Best Interiors winner for its premium materials and high style. Available with 2- and 4-wheel drive, the Ram 2500 and 3500 will continue to be built in Saltillo, Mexico, with three cab varieties: regular, crew and mega. 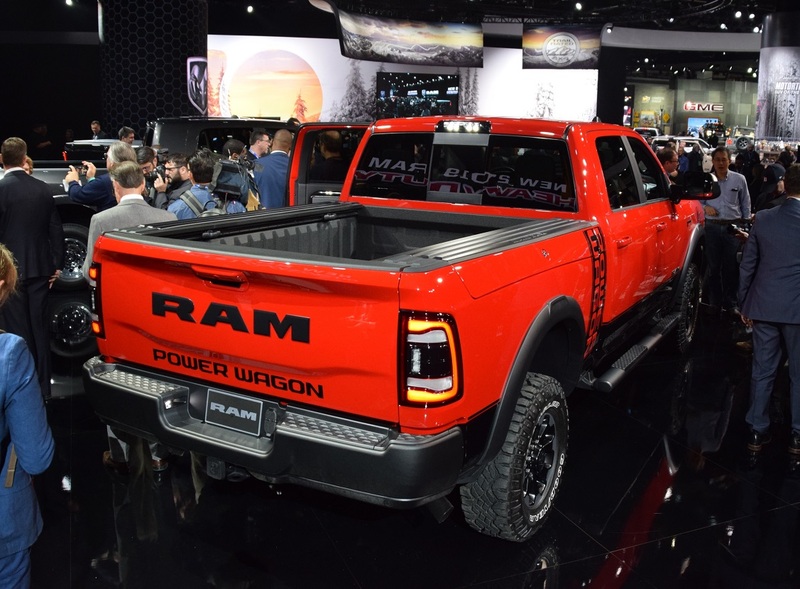 Also available this coming year will be the Power Wagon (see photo below), which Ram says is the industry’s most capable production off-road truck, with a factory suspension lift, locking front and rear differentials, disconnecting sway bar and 12,000-lb. (5,443-kg) winch. The Ram brand launched in 2009, when it sold 263,000 trucks in the U.S. In 2018, Ram sold more than 720,000 vehicles, Bigland says, claiming 22.3% of the fullsize truck market, up from 15.5% in 2009. In the fullsize pickup segment, Ram was No.3 in 2018 with 642,408 sales (up 5.8% over 2017), according to Wards Intelligence data. No.1 was Ford F-Series with 1,066,078 vehicles (up 2%), while Chevy Silverado was second with 752,849 units (up 2.4%).